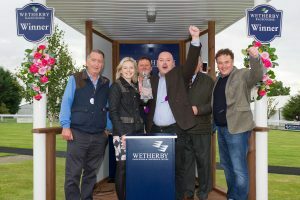 For the 28th successive year, Spinal Research are hosting their annual Northern Raceday at Wetherby Racecourse’s Opening Meeting of the 2018/19 Jump season, Wednesday 17th October. The Spinal Research Hospitality Marquee is located in the heart of the action, amidst the hub of the Paddock , adjacent to the Parade Ring & Winner’s Enclosure. The marquee is fully heated and has private tote betting, Racecourse TV and cash bar facilities. The main betting ring is located less than 100 metres away, as is the covered Bramham Grandstand, offering an elevated view of the racing action. The Marquee will be hosted by volunteers for Spinal Research, and is open to all to book. Private tables of 10/12 are available (or grouped tables for larger parties); smaller parties may be seated on our shared ‘Connections Tables’. Reserved ‘B’ Car Park Permit – limited availability to early bookers. SAVE £5 per package if you book before 1st September. Wetherby Racecourse reserve the right to make changes to the menu at any time. We do not take provisional bookings for this package, and ask for payment in full at the time of booking. On receipt of your payment you will be sent a booking confirmation. Vat Receipts can be provided on request. Approximately 4 weeks prior to the raceday you will be sent a full Racing Pack which will include your raceday admission badges, car park permits (If applicable), itinerary, menu and a pre-order wine list. After this time you will be asked to notify us of any attendees with special dietary requirements. Please do not hesitate to contact us if you have any questions regarding making a booking. Spinal Research have been given the opportunity to further raise funds for their charity by encouraging supporters to Sponsor a Race on the day. So if you have a business or product you are looking to promote, or if you have a special occasion or milestone celebration coming up, then this could be for you! Make a real day of it, take a table in the marquee and join in the day’s racing proceedings. As a race sponsor you and your guests will get to enter the Parade Ring to judge the horse you deem to be the ‘Best Turned Out’ in your race, you can watch your race from the Owners Suite and you will present a prize to the winning owner, trainer and Jockey of your race in our Winners’ Enclosure. You will also receive branding positions across the course and a full page advert or notice in the racecard and on the Racecourse TV screens. Thanks to the innovative research they have funded, many experimental treatments, including those to restore movement and feeling, have had positive effects on spinal cord injury in the research laboratory. They are determined to see these treatments transferred to the clinic, transforming the lives of paralysed people. This medical research will not only benefit people with a spinal cord injury but also advance treatments for other conditions including multiple sclerosis, Parkinson’s, stroke, dementia and motor neurone disease. Spinal Research receive no government funding and rely entirely on the support of the public to raise funds for our research. Because of the efforts of their supporters, they have funded over 140 research projects which have achieved a number of ground breaking changes in the field. Back again in 2018.. The ever popular Spinal Research Charity Auction will take place after luncheon within the Hospitality Marquee. There are some fantastic auction lots available, some of which will be posted here shortly.